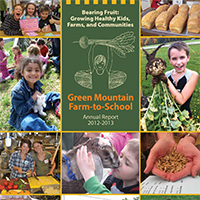 Vermont- 10/19/2015 – October is National Farm-to-School Month, a nationwide celebration of farm-to-school established by Congress in 2010, and schools, organizations, and institutions in Vermont have a lot to celebrate. 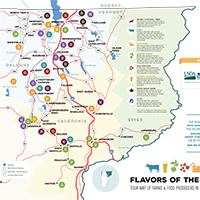 More than ever, seasonal, Vermont produce is being used to educate kids about agriculture and healthy eating habits in schools across the state – such as through conducting taste tests which is the theme for Vermont’s celebration of National Farm-to-School Month. 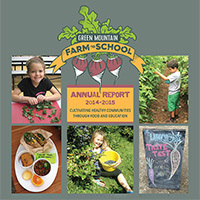 According to Farm to Institution New England, over 200 schools participate in farm-to-school programming in Vermont. Initiatives such as planting school gardens, conducting taste tests, and sourcing local food in cafeterias are helping students learn to make informed food choices while also fostering local, economic development. 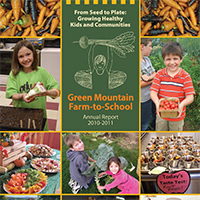 Farm-to-school programming in Vermont has proven to be extremely versatile and applicable in almost any geographical region. 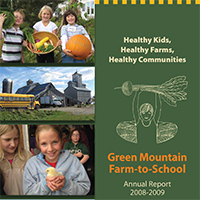 For example, Vermont Harvest of the Month, a statewide campaign created by Green Mountain Farm-to-School, Food Connects, and Vital Communities, provides ready-to-go materials for the classroom, cafeteria, and community to promote the use of local, seasonal Vermont produce and is being utilized in more than half of Vermont’s schools and various other institutions such as hospitals and restaurants. 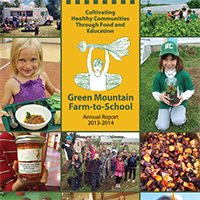 The concerted effort to introduce more local food into school meals and the classroom by organizations, schools, and institutions, has culminated in the Vermont Farm-to-School Network 10-year strategy to bring farm-to-school to every community across the state. 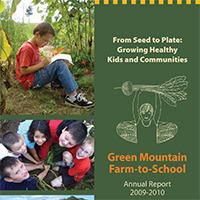 Finalized in 2015, over 60 farm-to-school leaders in Vermont met to create a plan to implement farm-to-school in Vermont with a goal to engage “75 percent of our students in integrated food system education, community-based learning, nourishing universal meals” and for them to know they can make a difference and have schools purchase “at least 50 percent of food from socially just, environmentally and financially sustainable regional food system” by 2025. 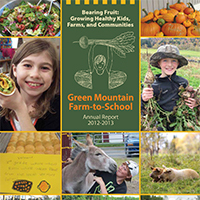 Support for farm-to-school programming in Vermont comes from a variety of places. Vermont’s Agency of Agriculture, Food, and Markets has funded farm-to-school grants and technical assistance since 2007 allocating over $800,000 to “engage students in their local food system by incorporating local food and farm education in their cafeterias, classrooms, and communities.” Earlier this month, Vermont Agency of Agriculture secretary Chuck Ross, alongside Agency of Education secretary Rebecca Holcombe and Vermont Department of Health commissioner Harry Chen, announced $50,000 in funding available in 2016 to continue expanding farm-to-school programming for Vermont schools – program applications for available funding must be received by the Vermont Agency of Agriculture no later than 4:30 PM on Friday, Nov. 6. The Vermont Community Foundation, a public charity in Vermont serving and supporting people who are working toward improving the quality of life in the area, also lends its support to the burgeoning farm-to-school movement in the state through its Food and Farm Initiative. 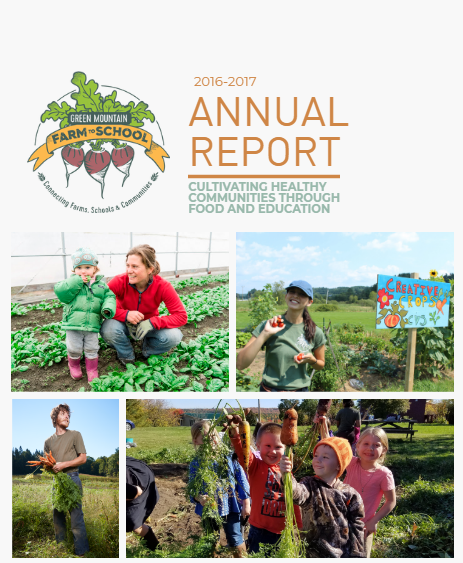 In June 2015, they awarded 12 grants totaling $503,000 to “support continuing local and statewide efforts to help connect Vermont families of all incomes with local food” including projects that were focused on continuing the momentum of farm-to-school in the state. Many other organizations and initiatives are providing critical support and people-power to make sure farm-to-school keeps growing in Vermont. Vermont Farm-to-Plate, Vermont’s statewide food system plan to strengthen all aspects of the Vermont food and production, Vermont Food Education Every Day (FEED), an initiative by Shelburne Farms and Northeast Organic Farming Association of Vermont, and the Vermont Agency of Agriculture, Food, and Markets offer programming and support to farm-to-school statewide. Organizations such as Green Mountain Farm-to-School, Food Connects, Vital Communities’ Upper Valley Farm-to-School Network, Rutland Area Farm and Food Link (RAFFL),Northshire Grows, Healthy Roots, Burlington School Food Project, and Addison County Relocalization Network (ACORN)focus on areas within their geographic regions to provide farm-to-school programming and support for communities. 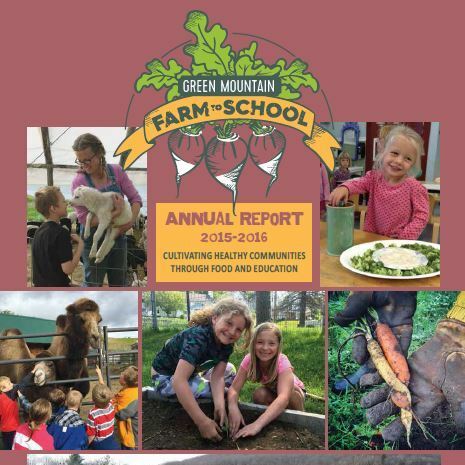 Vermont has long been recognized as a leader in the farm-to-school movement, and it is continuing to grow, as more children receive education on agriculture and healthy eating habits healthier communities will continue to be fostered. Food Connects is a non-profit organization in Battleboro, Vt. For more information, visit www.foodconnects.org or call 802-579-1082. Vermont FEED is a project managed between Shelburne Farms and Northeast Organic Farming Association of Vermont. For more information, visit www.vtfeed.org or call 802-985-0318.